The crises of the 1930s and 1970s led to profound structural transformations in the world economy. It remains unclear whether the 2008 crisis will bring about a similar reconfiguration. Within Britain, it appeared that the Coalition government had contained the crisis by 2015. The Coalition effectively re-established Britain’s finance-led growth model and pursued an orthodox liberal policy of austerity. However, under the surface, important shifts were afoot. A new regime of ‘loose’ monetary policy had crystallised. 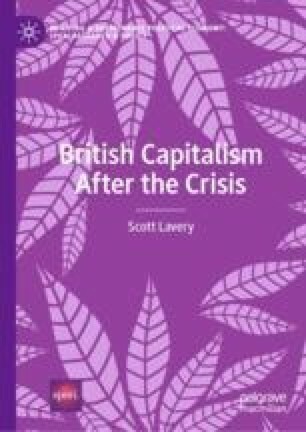 New forms of post-crisis politics—exemplified by Brexit, May and Corbyn—sought to advance programmes of social and economic reform. Whether these dynamics will lead to a transformation or consolidation of Britain’s dysfunctional model of capitalism remains an open question. Perraton, J. (2015). The UK Balance of Payments: In the “Red Signal” Zone? Sheffield Political Economy Research Institute (SPERI) Blog. Retrieved February 20, 2016, from http://speri.dept.shef.ac.uk/2015/02/03/uk-balance-payments-red-signal-zone/. SPERI. (2016). The Coming Crisis. Sheffield Political Economy Research Institute (SPERI) Blog. Retrieved from http://speri.dept.shef.ac.uk/category/the-coming-crisis/.